Yes, it’s back to school time once again. Whether it’s your first time moving into student housing or the last, you’re probably overwhelmed with all of the bits and pieces you need to make your space feel like home. You’ve got your towels and your bedding, your books and your laptop, your clothes and your photographs. But what about other technology that can help elevate your dorm room from basic to spectacular? Once again, we’ve got you covered Smart Gadgets to Totally Pimp Out Your Dorm Room Smart Gadgets to Totally Pimp Out Your Dorm Room Are you ready to trick out your dorm room or college apartment? From speakers to lights, here are some of the best smart devices for your home away from home. Read More with some of the hottest smart devices for your home away from home. 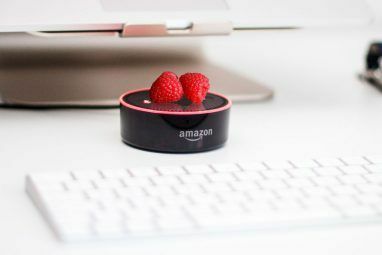 This year’s list includes products to make your year more enjoyable and safe, including voice-activated and Bluetooth speakers, smart lighting, and security cameras. You’ll also find some fun products along the way too — because what’s the point of having smart gadgets if you can’t show them off a little bit? College life is supposed to be fun, even during a night of studying in your dorm. Here are some internet-connected gadgets that are sure to make your life more enjoyable. First introduced in late 2016, Google Home is Alphabet’s answer to the ever-popular lineup of Amazon Echo devices. At the heart of Google Home is an integrated “high-excursion” speaker that delivers “crystal-clear highs and rich bass.” You can use it to listen to your favorite music or podcasts from various providers including Google or YouTube Music, iHeartRadio, Spotify, Pandora, and more. Google Home’s killer feature Google Home Review Google Home Review Google Home is a personal assistant smart speaker, and comes from a company that literally knows everything. The $130 Google device answers questions, controls your smart home, and plays music. Should you buy one? Read More is Google Assistant. Like Amazon Alexa, Google Assistant uses a cloud to answer your questions. Unlike Alexa, Google Assistant uses natural language processing, which improves reliability. As a bonus, the appliance can also access your Google account for information about your daily schedule, assuming that you use Google Calendar. As you’ll see below, Google Home also integrates with other smart home products, including lighting, security cameras, switches, and more. 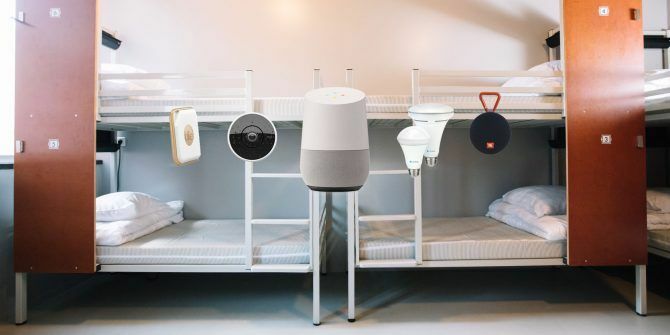 While Google Home’s understated appearance won’t win any design awards, it will blend into your dorm room’s decorations easily. Regularly priced at $129, Google Home is often available for less at retailers such as Best Buy, Walmart, and Target. Just the music, please. If you’d rather not buy a voice-activated speaker but are still looking for something to listen to your tunes, I’d strongly recommend the $100 Wonderboom by Ultimate Ears and $60 JBL Clip 2. Both speakers are waterproof and easily portable. Just use the Bluetooth on your smartphone or tablet and enjoy. Is your heart set on staying in the Amazon universe? A $50 Amazon Echo Dot connected to a $50 VAUX Cordless Home Speaker makes a great combination. Video more your thing? The list of impressive video streaming products is long. 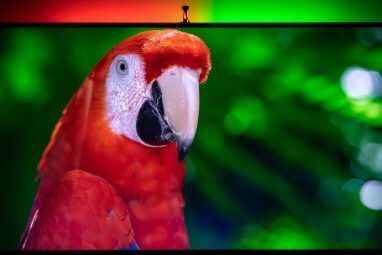 It includes Apple TV, Roku’s entire lineup of streaming TV and media players, and Google’s Chromecast. It wasn’t that long ago when adding smart lighting products to your dorm room might have cost the same as another tuition payment. Today, these type of devices are getting less expensive and yes, even smarter. Stack Lighting includes many unique features, including the ability to adjust the color temperature to the time of day. Called circadian lighting, this feature allows you to sleep more soundly. It also provides a wake-up alert. These lights include occupancy sensors Are Stack Smart Lights the Affordable Alternative to Philips Hue? Are Stack Smart Lights the Affordable Alternative to Philips Hue? Stack lighting offers features that are missing from the Philips Hue. In this article, you’ll see how the newest kid on the block compares to the original regarding features and price. Read More built right into the bulb, allowing them to turn on and off automatically. They also contain light sensors so that your lights automatically dim and brighten according to the natural light in your room. An $89 Stack Classic Starter Kit includes two light bulbs and the necessary hub. The IntelliBulb Simply Smart light bulb series from Feit Electric are noted for being incredibly inexpensive while not requiring any additional hardware or a special app. Instead, they’re controlled using motion or your dorm’s existing light switch. With the Switch to Dim light model, you can choose from three levels of adjustable dimmer lighting, 100 percent, 60 percent, or 10 percent. Just turn the bulb to make an adjustment. If you like a little bit of light in your room at night, consider the Dusk to Dawn bulb. With a built-in light sensor, the bulb automatically turns on and off depending on whether it’s dark. You can purchase the $10 Switch to Dim and $13 Dusk to Dawn bulbs through Amazon. The $30 Olens LampChamp turns any lamp into a USB charging station so you always have power at your fingertips. The 2 AMP USB charger works in concert with your existing light bulb. Use it to power and charge smartphones, tablets, and more. You may also want to consider TP-Link, which offers a full line of economically priced smart lights ideal for your dorm room. These include color changing, white, and dimmable lights. Each is easy to control using the free Kasa app for iOS and Android. Improved technology and falling prices make security cameras Practical Uses for Your Home Surveillance Cameras Practical Uses for Your Home Surveillance Cameras Home surveillance cameras are getting more popular with each passing year as technology improves and prices drop. Here are some practical uses for home security cameras, some which may surprise you. Read More a great option for college students. Not only do these cameras protect your space when you’re not at home, but they can serve as a way to record special moments such as parties and other events. The Circle 2 by Logitech is a 1080p HD home security camera that you can use indoors or out. Featuring a 180-degree field-of-view, the Circle 2 is available with or without a wire. You can monitor and record videos via the free Circle app. Other features include auto night vision up to 15 feet, digital zoom, and built-in speaker and mic for two-way talk. The Circle 2 is priced at $180 for the wired model and $200 for the wire-free option. The less-expensive $99 SimpliCam by SimpliSafe is another great solution. Offering 120-degree field of vision, the SimpliSafe provides audio and video recording, live streaming, night vision, and motion detection. For the price of the SimpliCam, you can store up to 30 days of video for free, and download or share clips for later viewing. Looking for more? SimpliSafe offers security bundles that include motion sensors, smoke detectors, and wireless keypads too. Tend Insights’s Lynx Indoor camera packs a lot of great features into its tiny frame, including face detection, live streaming, cloud storage, and analytics. All of these features make it an ideal option for students concerned about their dorm’s security or their roommates’ integrity. Did I mention the price? The Lynx Indoor camera is priced at just under $60 which makes it a bargain when compared to other security cameras on the market. 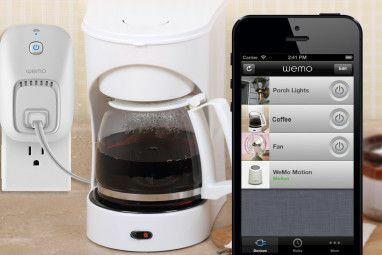 Often, smart plugs are the first type of smart home product 10 Creative Uses for Smart Plugs That'll Make You Want One 10 Creative Uses for Smart Plugs That'll Make You Want One Smart plugs are the most basic element of any smart home. Here are several ways smart plugs can get your dumb appliances online. Read More people experience. These products allow you to control your non-smart devices from anywhere in the world via your smartphone by turning them on and off remotely or scheduling their activation times. The $50 iDevices Switch remains a popular choice for home owners and renters alike. The product works with Amazon Alexa and Apple HomeKit for voice commands. Other features include the ability to create unlimited schedules to turn your devices on/off based on your daily routine, remote access (which allows you to control and monitor your electronics from anywhere), and easy setup. For added convenience, the iDevices Switch also works with Apple Watch. The Smart Plug Mini by TP-Link offers similar features. However, instead of working with Apple HomeKit, it’s one of the few smart plugs compatible with Google Assistant. If you purchased a Google Home (or have Google Assistant on your smartphone), you can easily control your devices using your voice! Featuring a compact design that blends into your power outlet without blocking other sockets, the $30 Smart Plug Mini is available through Amazon. There are two final smart products worth considering if you’re heading to college: the Tile Pro-Series tracker devices and Eclipse solar backpacks. Launched in 2017 and priced at $35, the Tile Style and Tile Sport are next-generation versions of the popular Tile tracking devices first launched in 2013. These Tiles are stylish, rugged, waterproof, and offer two times the range and volume of their predecessors. With Tile, you’ll never lose your keys, purse, or other important items again 7 Things You Didn't Know You Could Do With a Tile Tracker 7 Things You Didn't Know You Could Do With a Tile Tracker These are great reasons to have one (or a few), and I use my Tile to find my keys regularly. Using it frequently made me think: what else can I use these awesome trackers for? Read More . Looking for something a little bit different? Consider the $25 Tile Mate or the $30 Tile Slim. Eclipse’s lineup of solar backpacks come in various styles, including black, blue/gray, black/orange, camouflage, and more. These backpacks come with a thin-film solar charging module that provides up to 4 Watts of power to charge your mobile devices on the go. For daily walks around campus or long hikes, these backpacks are priced at around $170 and are available to order through the Eclipse website. From voice activated speakers to security cameras, there are plenty of smart home solutions available for a college dorm or apartment. Each is relatively inexpensive and easy to set up, and all will help you to have your best school year yet! What type of smart home solutions have you considered for your dorm room? We’d love to hear your tips and tricks in the comments below. Explore more about: Dorm, Google Home, Home Automation, Smart Lighting.